I have in front of me, as I keyboard this review, my prized copy of “The Reality of Being.” The copy is prized, despite the fact that it has not been autographed by its author; despite the fact that it lacks any association with an individual person, place, or incident; despite the fact that it was not given to me by a specially sensitive well-wisher; despite the fact that it was purchased through the Internet and arrived unheralded; despite the fact that it is the trade edition of the book that was published in thousands of copies in May 2010 and this is already October. The reasons why it is prized lie elsewhere and herein. I prize it because of the quality of its contents, and so I have reserved a space for it on the bookshelf in my study where I display the spines of a limited number of select volumes about the Work that were published over the last three-quarters of a century. This brace of books includes the three volumes of G.I. Gurdjieff’s “All and Everything” series, four books written by P.D. Ouspensky, “The Harmonious Circle” by James Webb, and perhaps a dozen slender volumes composed by people whose last names are Claustres, George, Ravindra, Tracol, Vaysse, Welch, etc. The typographical design of its pages appears at once casual and classical. The volume is published by Shambhala of Boston and London, which ensures it will be widely distributed and kept in print, and it is very reasonably priced at CDN $32.00. The publisher even had the signatures of the book sewn – most books these days have their pages glued together, a process euphemistically described as “Perfect Binding.” As well, they have added, like a sovereign crown, a bright yellow-orange headband. The book is a durable and handsome product, worthy of the muse or saint of printing and publishing, if there is one. Thank you, Shambhala, for taking pains! I hope I do not sound like a claque because, as well, I will praise in extravagant terms the editors of this book. On the mundane level I did not find a single misprint, and that rarely happens these days, even with scholarly texts issued by university presses. I did note, in passing, that there are discrepancies between the birth years of its subject and its author. The copyright page, which includes the by-now standard Library of Congress Cataloguing-in-Publication Data, gives G.I. Gurdjieff’s year of birth as 1872, whereas the text gives it as 1866. The same page gives Madame de Salzmann’s year of birth as “1889?” whereas the text gives the same year but without the droll question mark. But these are matters of amusement and no consequence, unlike the text of the book itself. The text is well organized, indeed super-organized, with a Foreword, an Introduction, twelve main sections, a Biographical Note, a list of the four Gurdjieff centres (Paris, London, New York City, Caracas), and an Index. Let me pause over the latter item, the twelve-page, double-column index, as indices are often overlooked, despite the fact that the attentive reader may tell a lot about a book from a cursory examination of its index. After perusing it, I thought, “The only personal name in this index – and hence in the text of the book itself – is that of G.I. Gurdjieff.” Then I looked closer and found three other names, those of Christ, Buddha, and Mohammed. Illustrious company indeed! Added to them, perhaps tongue-in-cheek, I found that of Ashiata Shiemash. So it is apparent from this index that the reader will not turn the pages of this book in order to be entertained by stories, anecdotes, or descriptions of the men and women who participated in the evolution of the presentation of Work principles and practices from Ouspensky’s “Special Doctrine” to Madame de Salzmann’s embodiment of the Fourth Way. The present volume is about as far from a gossipy book as it is possible to be. In fact, the book is about how it is “possible to be,” and in doing so, I find I want to describe the text as a collection of homilies. A homily is a commentary on a passage of scripture, and during a church service a homily is delivered following the reading of the specified passage of scripture. It is basically a sermon with a practical application of the general principles found in the day’s passage. Hence a homily deals more with practice and not directly with principle. It is hortatory. If I am right when I claim that what we have here is a series of homilies, it is also true that the thrust of the texts is towards the harmonization of the three centres of man. There is next to nothing about the speculative nature of this system of thought at least of the sort identified with the expositions of P.D. Ouspensky. The sections about the Law of Three and the Law of Seven are perfunctory in the extreme; indeed, they are credited by the editors to legitimate sources outside Madame de Salzmann’s notebooks, the source of these texts. Instead of regarding thought, feeling, and sensation as separate subjects, we have an integration of them within the human body. The index, once again, gives an idea of what is being emphasized, with entries such as these, each of which has a dozen or more page numbers: being, body, consciousness, contact, crystalization, efforts, energy, existence, feeling, instrument of knowing, mind, nature, order, perception, reality, relation, seeing, sensations, shocks, teaching, tensions, understanding, vigilance, voluntary suffering. There is an abstract quality to the exposition, certainly the quality of selflessness, so it is a relief that the texts themselves are surprisingly short – one page, two pages, three pages – seldom more. If they were any longer, they would be somewhat tedious to read; if they were any shorter, the expositions would be reducible to maxims, like the pages of sentence-long quotations that introduce each of the twelve sections. Two instances of these mantras are “We struggle not against something, we struggle for something” and “I have to maintain a continual sensation in all the activities of my daily life.” In his memoir of Madame de Salzmann called “Heart without Measure,” Ravi Ravindra made exceptional use of such expressions of experience. The structure of this book as a collection of meditations or a passel of ponderings is such that it may not meet the needs of the novice in the Work, but by its nature it will address the deep-seated needs of people experienced in the ways and words of the Work, people who are in need reminding. In a way the present book reminds me of Maurice Nicoll’s multi-volume set of “Psychological Commentaries” in which each short essay concentrates on one particular element of the teaching. Whereas Nicoll is intellectual and philosophical, Madame de Salzmann is physical and functional..
Each of Madame de Salzmann’s texts illuminates an aspect of the Work, what used to be called “the practice of the presence of God” and what is now recalled by the words of the title of Patty de Llosa’s fine book “The Practice of Presence.” As Nicol was indebted to Ouspensky, Madame de Salzmann is indebted to Gurdjieff. Over the last fifty years or so, I have watched as the word “religion” has been replaced by the word “spirituality” and how that word is now passing out of style in favour of such words as “being,” “presence,” “consciousness,” and “awareness.” Who knows where it will end (to pose a Zen-like question!)? If the sign of a fine translation is that the reader hears the sound of the voice of a person whose words are being rendered into another language, this translation is sound indeed! I have never heard words spoken by Madame de Salzmann, but as I read these words I feel I am hearing her speaking her own words in her own way. She owns them. Her use of words is measured, they are masterfully chosen, and they are rhythmically arranged. There is a flow of language to match the flow of the teaching. The English translation from the French seems amazingly fine. Yet there is no way to ensure that this is so because the French originals of the notebook are not in print. Indeed, it seems that this English edition is the “editio princeps,” as the French text has never been published. A world first. Who edited this book? 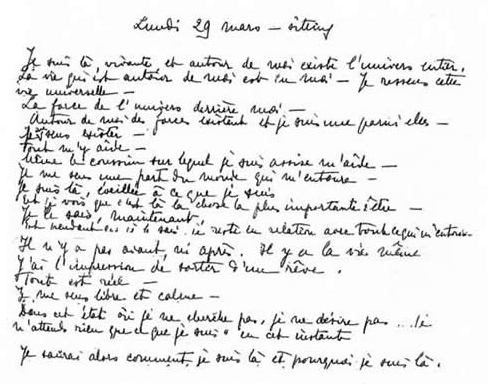 Who prepared the translations from what are described as the “notebooks” kept by the author over the last half-century, from the death of Gurdjieff in 1949 and the death of Madame de Salzmann in 1990 at the age of 101? (Both the Library of Congress and the text of the book agree on these years!) “This book was edited by a small group of Jeanne de Salzmann’s family and followers.” Thus reads the last paragraph of the Foreword. This is a self-effacing sentence, so I wish I knew more, so I could credit the collective effort of family and followers. Maybe I do know more. I have heard that the positive force behind the book’s appearance originated with the author’s daughter Nathalie de Salzmann de Etievan, who died in 2007. The project was carried out by a couple, Nathalie’s daughter Anne-Marie and her husband Stephen Grant, a retired New York lawyer, supported by the author’s grandson Dr. Alexandre de Salzmann. The labours of Anne-Marie and Stephen, to use their first names without leave, were no doubt augmented by those of other unnamed contributors. Their efforts “have surpassed expectations,” as M.B.A.s in business schools are wont to say these days. The organization and presentation of the Work that is currently overseen by the four Gurdjieff centres would seem to be based on the efforts of preservation, continuation, elaboration, and extension led by Madame de Salzmann and continued by her son Dr. Michel de Salzmann until he died in 2001.” The text reads, “Before Gurdjieff died he charged Mme. de Salzmann to live to be ‘over 100’ in order to establish his teaching.” She certainly succeeded in more ways than one! What is her message? Here any reviewer has to make a decision. He can either report on what the author says in the order of the excerpts from the notebooks that appear here, and thereby write at considerable length; or he can summarize the approach that the author takes, and thereby risk sounding somewhat platitudinous. After pondering the matter, what I have decided to do is offer the reader two sentences, no more, on each of the twelve sections of the text. They will give the flavour of the whole and a sense of its direction. The first sentence is my summary of the argument of the section, expressed in language that sidesteps the terminology of the Work. The second sentence is taken from that portion of Madame de Salzmann’s text and represents an idea or a formulation that struck me as a novel in expression if not new in insight. The book is so arranged as to lead the reader from the simple to the complex, yet at the same time the text resembles a hologram, for which every portion is a portal to the whole. These twelve chapters take the reader from a concentration on the ego through schools with practices to a sense of the cosmos, not really step by step but all at once. Hologram-like, these homilies repeat the main thesis that change in level of being is possible and they treat the reader to an array of approaches to the central existence of gnosis or the “knowledge of being.” The book is rightly named “The Reality of Being” for it deals with what is most real in us and in the world in which we live. This is Madame de Salzmann’s predominant testament, one that is to be prized. 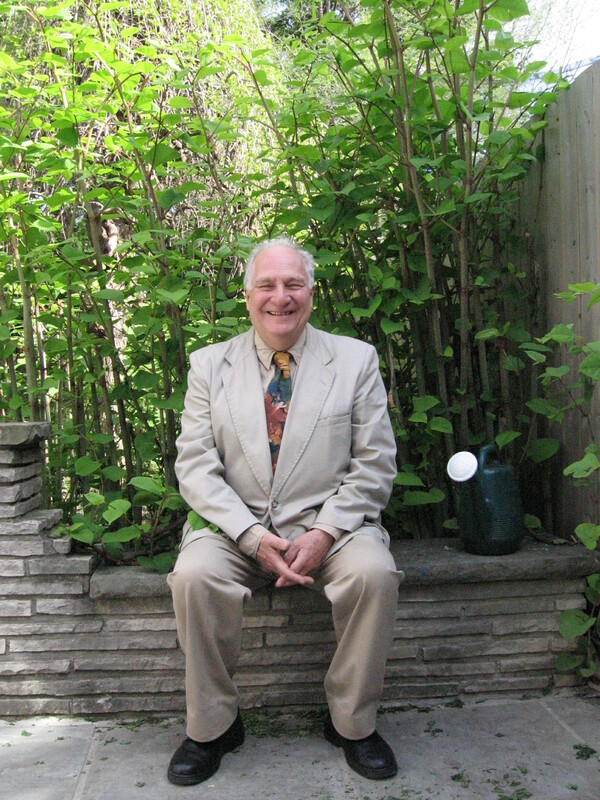 John Robert Colombo, Toronto-based author and anthologist, has recently published “Poems of Space and Time,” a collection of 360 poems written over the last half-century and inspired by “the fantastic imagination.” Watch and hear him read some poems on YouTube. Listen to his podcasts on topics of the day on his website: www. colombo -plus. ca. He writes regularly on Fourth Way subjects for this blog.